"Green Tip Penetrator" is probably not a phrase you should bandy about lightly. In a room full of west coast legislators, it could get you a new gun law on the books. In a range session it could cost you half your case lot if you brought enough shooting buddies. In a CQB scenario it might cause the bad guy to just turn around and give up. It’s a phrase that has become synonymous with the idea that you brought a very potent round to the table in whatever situation you found yourself in while talking about it. People know what it can do, and the background story seems to get lost in the fray. But that’s the saddest part, because the background story is pretty great to listen to as well. 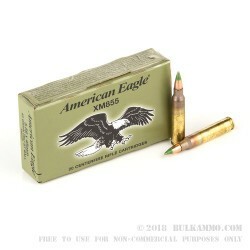 In the background, this is a brass cased cartridge with a clean burning powder and a potent delivery system for the heavy 62 grain weight projectile. It is Boxer primed and has an annealed case throat which makes it very desirable for reloading purposes. It is dead accurate out of the right barrel twists, and very close to dead accurate even out of the wrong barrel twists. It is ridiculously fun to shoot and has great impact performance for reactive targets and on old decaying jalopy vehicles in the middle of nowhere. It may even have an unhealthy relationship with the occasional bottle of Tannerite. All in all, it is just one of the best rounds you can buy for the 5.56x45, so GET SOME! Q: I was inspecting these rounds and it appears the tips have been dipped in a green paint / substance. Is this to help track the firing trajectory, or a simple manufacturing design. Thanks. 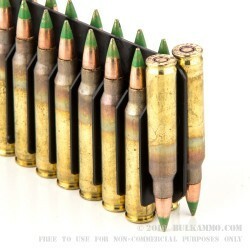 Posted On: 10/20/11 By: Rich P.
A: These are called "Green Tip" 5.56 rounds. 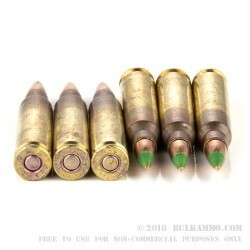 This paint on the nose of the bullet is to help distinguish standard M855 ammo (green tip) from M856 tracer ammo (orange tip), M995 AP ammo (black tip), and Optimized (for short barrels) ammo (brown tip), among others. A: Rob, the G7 ballistic coefficient (BC) of the SS109 projectile in this M855 ammunition is .158. Please note that a G7 BC is different than the G1 BC provided by most manufacturers, but it allows for a more accurate calculation of trajectory and wind drift. The velocity of this ammunition is 3,100 feet per second from a 20" AR-15 or M16A2. It is not expanding ammunition, rather, it was designed to meet specific armor penetration requirements at various distances. 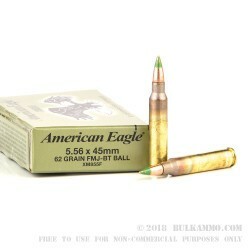 A better choice for light, thin-skinned game such as white tail deer would be the Federal Fusion 62gr bonded ammunition. Q: Would you recommend this ammo for personal defense? If not, which would you recommend? A: What are you defending against? This M855 ammunition was designed to defeat steel armor at extended ranges. From an M16A2, it will penetrate a 10 gauge sheet of steel as far as 700 meters from the muzzle! Against soft targets, 75gr or 77gr HPBT and 62gr bonded ammunition such as Federal Fusion are much better choices.